This Christmas was an interesting one for us as it was our first in Cheltenham where we have finally settled after 20 years in Berlin. Needless to say, I tried to fit in a few festive markets. My first stop was the Cheltenham Christmas market which was disappointing. Well, it would have been wouldn't it? What did I expect after 20 years crunching through the snowy landscapes of fairy-tale German Weihnachtsmärkte, gluhwein in hand, assailed by wafts of cinnamon, toffee apples and waffles? Cheltenham's was literally a damp squib by comparison, not that that could be helped. The Cheltenham Connect Christmas Craft Fair on Bath Road was rather more successful. All those small stallholders wearing silly elves hats and deer antlers selling lovely handmade items chimed better with the Christmas spirit. There was a complete absence of tasteless tinsel and I even found a couple of stalls selling goods made using recycled materials! I have already written about the Christmas hedgehogs. Another stall to catch my eye was being manned by Jim Blenkinsop - above. Jim is a self-employed engineer who creates extraordinary works of art with his wife Helen (an artist and bridge teacher). 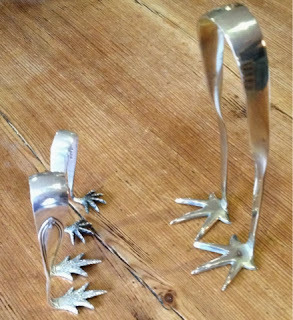 They call their enterprise "Or(e)" and they use unloved vintage metal ware to create contemporary objects with a twist. In this picture the candlesticks have been tweaked and improved with the addition of the coloured balls. 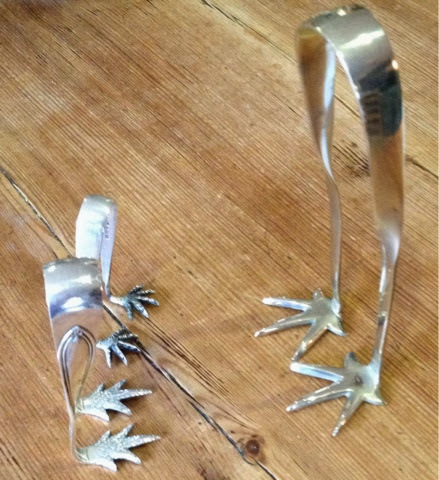 These "birds' claws" were once sugar tongs desperately in need of a new purpose, as no one ever seems to use tongs these days. 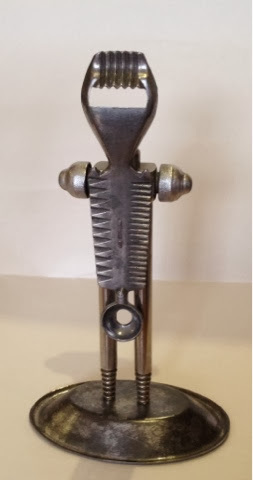 Jim and Helen seek out pre-World War 2 quality metal on ebay and at car boot sales - they describe this metal as their single common denominator. 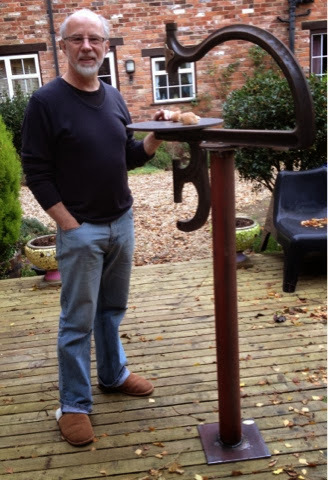 In the picture at the start of this blog article, Jim is standing in his garden next to a bird table that he made from a 19th century scroll saw originally used in New York for cutting veneers to make marketry. Below, 1930 vintage secateurs ("really beautiful metal" says Jim) have been reworked by him with Helen's creative input into these birds. 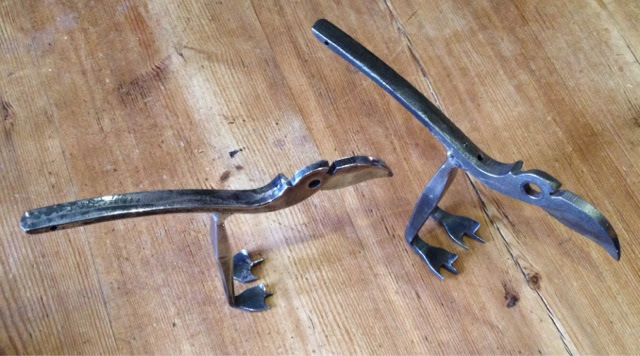 The bird legs were once forged steel woodworking bits. and well, you decide what has gone into the next creation! 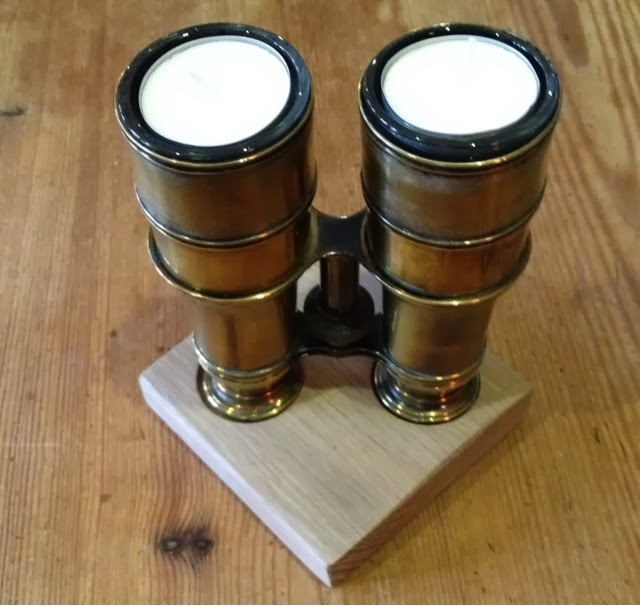 Jim and Helen welcome commissions and can be contacted on jimblenkinsop@mail.com or 07980447673. 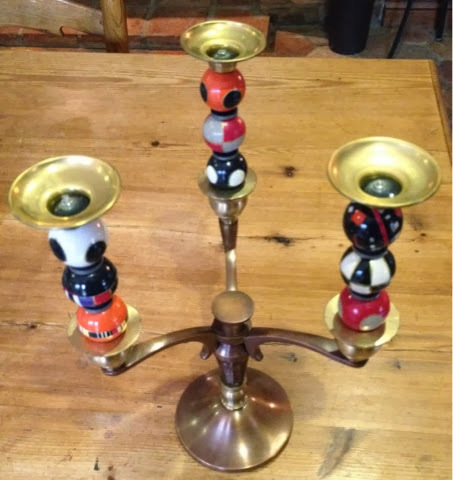 If you have any unloved metal items you would love to be turned into something entirely new and decorative, Jim and Helen are the people to contact.